The following article will take you through the first steps as you create your first form in WizeHive. you have effectively initiated a new form, with no fields yet added to it. 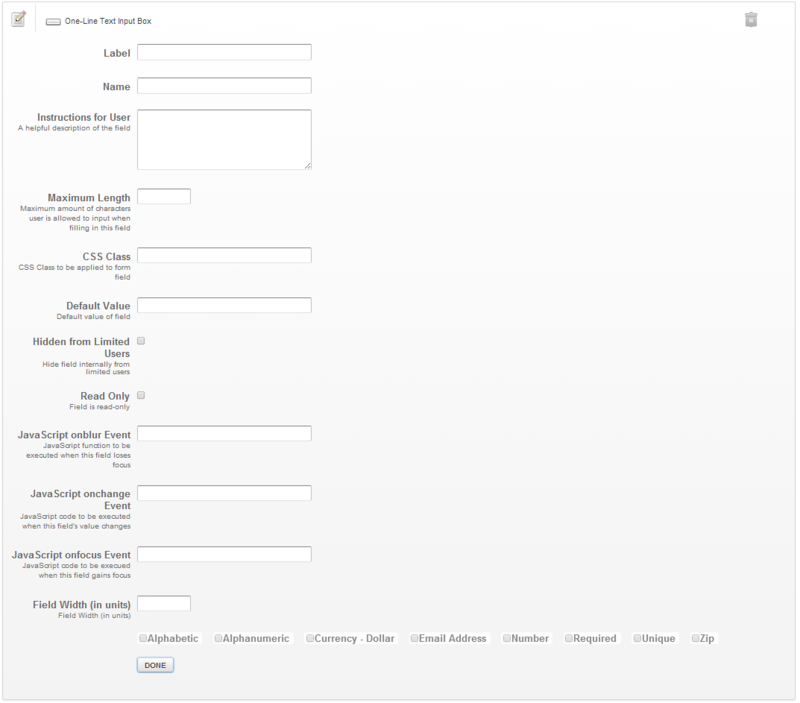 When you create a new form, or elect to edit an existing form, you are brought to the form builder, shown below. You begin to add fields by clicking on “Add a New Field.” When you do, you should get the list of field types. You can click the garbage can on the right to delete a field. You can also drag and drop the field to rearrange the order of the fields by clicking and dragging on the four horizontal bars next to the garbage can. You will see different combinations of properties to address dependent upon the type of field you have chosen. Each field type has a number of different properties that will appear. These field types are introduced in Field Type Glossary. Label: Represents the name of the field as you want it to appear on the form. Normally labels are kept to a modest number of characters. If you want to display extensive label text it is usually best to a) place that text in to the instructions of the form or (b) put an explanatory field using an HTML field just above that field on the form. Name: Represents what the field will be called within WizeHive. It is best to keep this text short but clear. When you build reports from this data you will be presented with a list of field names to choose from – the clarity with which fields are named will make report definition significantly easier. Instructions for User: Instructions represent the text that will appear when a user/applicant hovers over the “?” icon that will appear next to the field. This text helps the user obtain additional instructional information about completing that field. Hidden from Applicant: Field is not displayed to the applicant but is still present internally. Questions designated with this distinction will not appear in an external Portals (Private or Public). 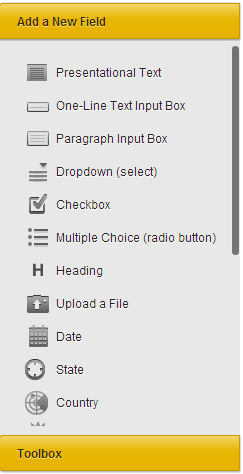 Special Considerations: When you are done editing the information for a field you can click on “Done” or click on the top of the box you are editing. Either will close the window for that field. Note, this does NOT save the form data. You must click “Save Form” to save all form data. At any point you can preview what the form looks like by clicking on the Preview button. Like opening the form builder itself, the preview will appear in a new browser window so you will need to make sure your browser setting allows this. The preview button will show the last SAVED version of the form. Be sure to SAVE your changes before previewing your form. HINT: When building forms consider keeping the Preview window open. As you make changes, save them and then simply “refresh” the preview window to see the impact of the changes. Once your form has been created and saved, you may close the form builder window. Once you save this window, remember to save the underlying Form Settings in the window where you were working.